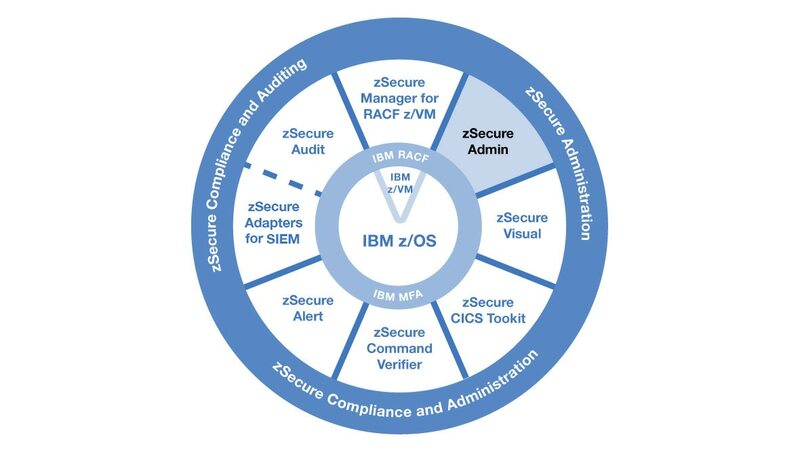 IBM® Security zSecure™ Admin automates and simplifies IBM Resource Access Control Facility (RACF®) security and compliance administration tasks and enhances RACF delegation capabilities and identity governance. By automating many recurring system administration functions and enhancing the native RACF authorization and delegation capabilities, zSecure Admin helps you maximize IT resources, reduce errors, increase efficiency, improve service quality and identify problems quickly to help minimize security risks and demonstrate compliance. Automates recurring security tasks such as managing passwords and copying or removing user and group IDs, lowering costs. Identifies problems through robust, non-intrusive security capabilities. Merges security rules from different databases quickly and efficiently. Copies or moves users, groups, applications or whole databases between systems. Keeps multiple RACF databases synchronized. Generates commands to clean databases. Reviews commands to confirm cleanup actions do not affect definitions that must be retained. Increases system security by removing obsolete profiles.